Samuel Wiltshire was born in 1865 in Vernham Dean, Hampshire . Before he was 5, he had moved with his family to Newbury in Berkshire . At the age of 15, he was employed as a Groom, still in Newbury . In the late 1880s, Samuel married Millicent Simpson. In 1892 they lived at 20 Grove Road, Ealing and Samuel was described as a dairyman . In 1901 he lived with Millicent and their children at 2 Venetia Road in Ealing, and was a painter and decorator . Another document says he was a sign-writer. 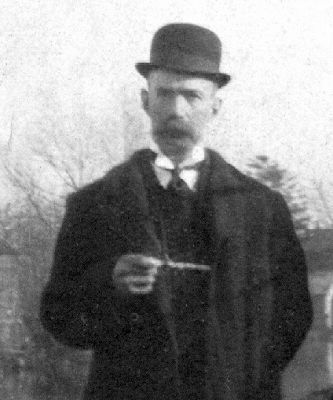 Samuel in about 1900. Samuel and (probably) his father.